A few weeks ago I was sitting on our couch, blogging my little heart out, when I had a crazy idea. "Mr. Goodlaff," I said. " You should write a guest blog post to share your point of view on this whole wedding business." When Miss Goodlaff and I talked about me doing a “guest blog”, I thought it would be easy. After all, I’m an educated guy, I have made presentations to the highest levels of management at every organization I’ve been at, and the reason this blog exists is because I asked her to marry me almost a year ago. However, when it came time to think of a topic to blog about, I drew a blank; not a blank because there’s nothing to talk about, but rather that there is so much to talk about. So I decided to make this like a free-form poem, I can ramble and do some stream of consciousness writing, and if people don’t like it, I can just tell them it’s because they don’t “get it”. Miss Goodlaff has spelled this out in the post titled “The Lunch”, but there was one part that she forgot that still makes me laugh. After I had emailed her asking her out, and she had replied, hinting that we were being setup that day, let’s just say I was less than pleased but kept that to myself. As Houdini and I were walking out to the car to go to lunch, I turned to him and said “Do you want to drive over with Tally and Miss Goodlaff, or do you want to just meet them there?” The look on his face was priceless, he had no idea I knew we were being setup, and the tap dancing he did was magical. My memories of that day are sparse but along the same lines as Miss Goodlaff. As she said, our first “date” after that was a lot easier as we had plenty to talk about – mostly how embarrassing our previous encounter was. Obviously everything ended up in a wonderful place, and it’s impossible to know if we would be here without the setup (I like to think we would), but it still was a pretty miserable day. Remember my super cute wedding shoes that I made shoe clips for? And just like that, I was a two-shoe bride; it's not really that much of a surprise if you know me. I'm a "the more, the merrier" type when it comes to footwear. Because Zappos proved to be such a goldmine the first time around, I went back there in search of perfect, comfy, post-heel, wedding day shoes, and I was not disappointed. It took me all of two seconds to find exactly what I was looking for, and once I spotted them, I don't think I even considered any other options. Those were it. The right color, just a bit of sparkle--done and done. Planning a wedding is all puppy dogs and rainbows. Before you really get into it there is nothing more exciting than the prospect of picking out the color of the napkins, the perfect dress, and making a guest list. Then, one day, you realize that the dog bites and constantly craps all over your floor, and that the rain prior to the rainbow is not a light mist, but actually sheets of pelting, torrential rain similar to the kind that causes mudslides in China. Bridal Crazies: when wedding planning insanity strikes down perfectly good people; i.e. insufficient supplies for making table numbers at the store causes a mini hissy fit; lack of enthusiasm for yellow shoes causes you to see red; lights for wedding decor at a reasonable price cannot be found anywhere, so you consider taking up glass blowing and learning the art of electrical wiring so you can make them yourself; when everything matters about 7000 times more than it does in real life because it's for your wedding. 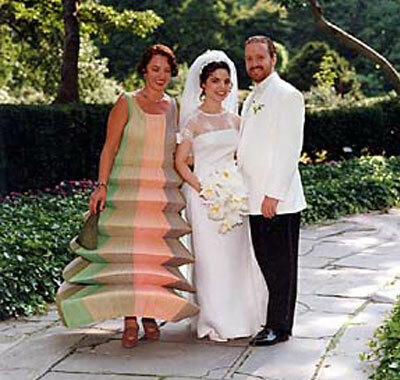 People who succumb to the Bridal Crazies are different from Bridezillas because they still retain vestiges of niceness and can recognize that they've gone batshit crazy. 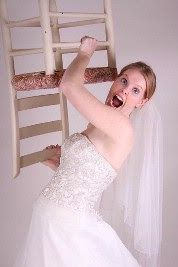 Bridezillas can't or won't acknowledge their insanity and tend to be kinda mean. Big difference. Usually I don't get excited when opening mail. Mr. Goodlaff comes home, sorts out the mail ("Miss Goodlaff, Mr. Goodlaff, Miss Goodlaff, Mr. Goodlaff"), and then I open and toss into the burn pile the credit card offers, grudgingly file the bills, and go on my merry little way. But today was different! Today's mail contained a card from Granny Goodlaff in Florida. I'm not gonna lie, I was a little confused by the appearance of a card in our mailbox. I went through a mental list of holdiays, birthdays, and events, trying to figure our the reason for the card, and none of them being even remotely close to occuring, I gave up figuring out why the card was there and just opened it. Sixpence! Sixpence for my shoe! I was pretty blown away by these two little coins; I mean, how cool is that sixpence from 1957? Plus, I'm now able to cross another item off of my bridal bingo list (still looking for old and borrowed). ﻿ I'm going to find a way to wear both of them in my shoes on our wedding day. Granny Goodlaff suggested that the small one may be more comfortable, but if one sixpence is good, then two is better, right? These coins totally made my day, and I love that Granny Goodlaff is keeping in touch and staying involved all the way from Florida. Did you have any awesome surprise gifts leading up to your wedding? Okay, I know, I know. Mr. Goodlaff and I were supposed to have our engagement pictures taken a while ago. With under 100 days to go before the wedding, I admit, we are probably cutting it close. BM Cosmo was teasing me last week that if we wait any longer to take our pictures, we will have to take them after the wedding. Ha. Ha. Very funny. The road to engagement pictures was paved with good intentions. The Goodlaffs planned on taking pictures in the Fall. 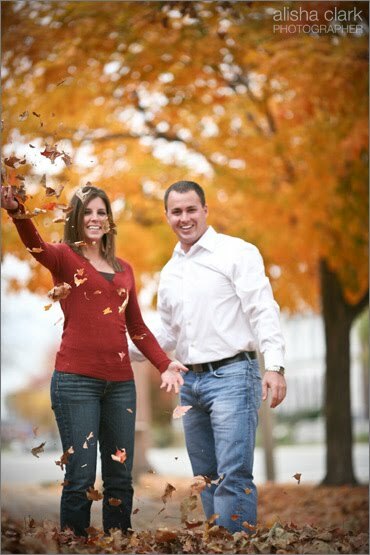 I love Fall--it's my favorite season, and I wanted nothing more than to have beautiful bold red, orange, and yellow leaves feature prominently in our photos. But, alas, it was not to be. I work in elections. We had an election in the fall. There was no time for engagement pictures. Boo. After Fall came Thanksgiving, then Christmas, and before you knew it, we were rolling in to January. Finally we set a date, and though it's dangerously close to being February, we are squeaking it in to the first month of this year. So, now that the date is set, how about a little bit of Engagement Session Inspiration? Warning, lots of pictures ahead! I have a floral confession: the only roses present at our wedding will be the single, long-stem roses we are giving to our mothers. Yes, you heard right. No. Roses. 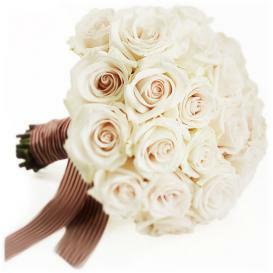 Am I a bad bride for not including such an iconic flower of romance in the wedding flowers? Maybe, but my floral budget sure is happier for it. It's not that Mr. Goodlaff and I don't like roses, or that we are allergic to them; it's just that when my wedding vision (use your mystical voice there) arose, there was nary a rose in sight. In a few months, Mr. Goodlaff and I will get our marriage license, and by the time we head into the Recorder's Office to do our paperwork, I will have made a decision about what my new name will be. But right now, I have no clue how I will fill in that paperwork. When I was younger, I always assumed that I would take my husband's last name and drop my own; I didn't really know there were any other options. But there are options--lots of them: I can keep my current name; I can take Mr. Goodlaff's last name; I can add Mr. Goodlaff's name to my last name with a hyphen; I can make my maiden name my middle name; I can add my maiden name to my middle name. In California, Mr. Goodlaff and I can even create our own last name (in fact, that's how this blog came to get its name). Right after Mr. Goodlaff proposed, I discovered my inner feminist. All of a sudden, dropping my last name and taking Mr. Goodlaff's wasn't a given. I've had my current name for 27 years now, and I rather like it; I feel that to leave it behind completely would be a little bit like losing a piece of myself (and I mean that in the least melodramatic way possible). Your name is so much a part of your identity--it's how you recognize yourself, how you define who you are. And not to go medieval on you or anything, but I have no brothers, and therefore there's no male heir to carry on the family name--I feel a need to represent. I'm not going to completely give up my last name, but I am going to take Mr. Goodlaff's name too. 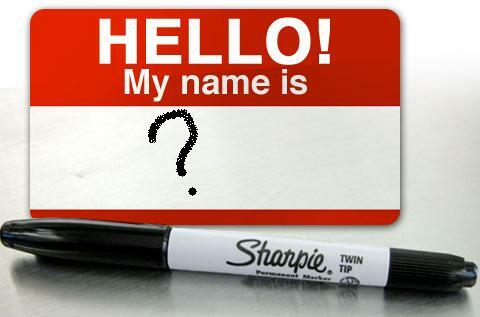 So, here's where the waffling begins: do I hyphenate or take my maiden name as a second middle name? 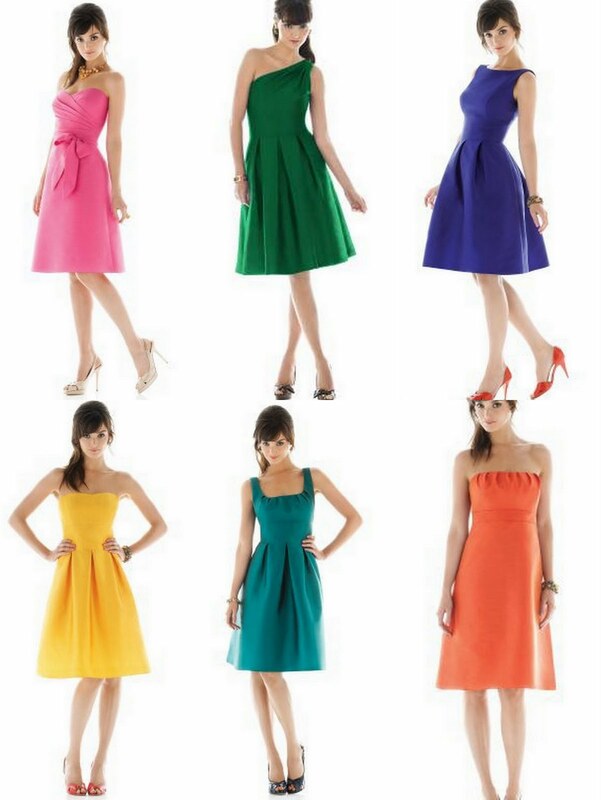 As you can see by all the different styles, there was no way that I could have picked one dress that would have made them all happy; looking back, I'm really glad I had the brains to not even try. I love all of these dresses, and I think they each look fabulous in the styles they chose. Sister Goodlaff, Cosmo, and TCollins will order this week (Sunrise already has--she's so on top of things! ), and then I can cross one more thing off of the list and rest assured that the Goodlaff bridesmaids will be fully clothed on our wedding day. We also have a resolution to the great shoe debate, which came in the form of a paper sample, of all things. Mr. Goodlaff and I are currently designing our invitations for the wedding (more on that later), and we ordered a few paper and envelope samples from cardsandpockets.com, one of which was silver. The minute I saw the silver against the swatch I have of the dress material, the decision was made. Silver keeps the color scheme cool and helps balance the pops of color, whereas yellow really warms it up. Plus, when everyone is telling you "no," you should probably listen. Silver shoes, blue dresses, yellow, white, and green bouquets. Done, done, and done. One of the last vendors that Mr. Goodlaff and I still need to book is a baker for our cakes. Let me tell you, living in a rural area severely limits our vendor pool, and that's definitely showing in our quest for a wedding cake. 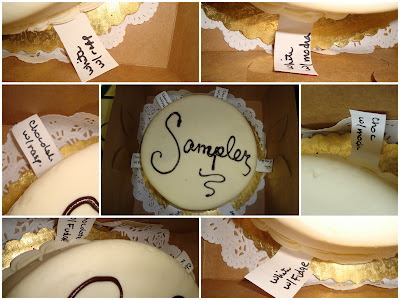 Mama Goodlaff and I were at a bridal fair a few months ago, talking to a local cake artist. 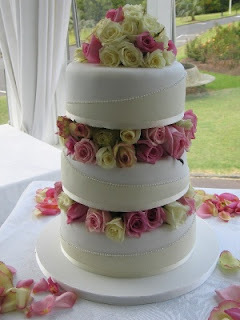 Her cakes were fantastic, and after chatting with her for a while, she asked who was doing our wedding flowers. I gave her the name of our florist, who happens to be a family friend, and she said, "oh, is that negotiable?" Um, no, it's not. She didn't like that answer, so she turned away from me and started talking to another bride. That baker's name was promptly crossed off the list. Her cake tasted great, but her utter lack of professional courtesy killed any chance she had of getting our business. Cake vendor number two took almost three weeks to get back to my initial phone call. Finally she sent her wedding cake packet, and after I sent her two additional emails asking for more information, I gave up trying to get into contact with her and crossed her off the list too. Communication is a must. 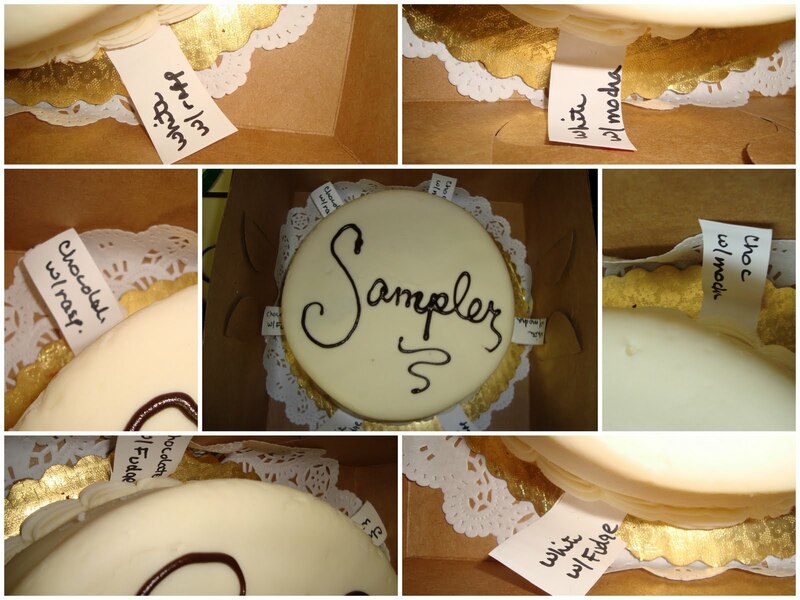 After striking out with two bakers specializing in wedding cakes, Mr. Goodlaff and I began looking at local bakeries. Since we are doing a cake bar, getting all of our cakes from a bakery may be a better option for us. It's cheaper than buying a full-blown wedding cake, and most bakeries already have many different types and flavors of cakes that wouldn't necessarily be available to us through a wedding cake vendor. Mr. Goodlaff and I call it "The Lunch" (you must use an ominous voice and air quotes when talking about it) because words beyond "the" and "lunch" are massively unnecessary. Sure, we have lunch every day, but this lunch was really the be-all, end-all in the entire history of lunches because it was the most excruciating lunch I've had to sit through. "Awkward" doesn't even begin to describe the hour and a half that Mr. Goodlaff, Houdini, Tally, and I spent at Lefty's Grill on that fateful Wednesday. When we left off, Mr. Goodlaff and I had agreed to meet for a lunch date on Friday, I had warned him of the impending set-up at lunch that day, and I was happily floating about three feet off my chair, waiting for 12:30 to roll around. 12:30 finally came, and Tally and I were off! We parked and walked to Lefty's, only to *gasp* run into Mr. Goodlaff and Houdini who were already seated directly across from each other at a table for four. I sat next to Houdini, across from Tally, and kitty-corner from Mr. Goodlaff, who, right that second looked like a prisoner on death row about to get his last meal before facing the firing squad. Shoulders hunched, eyes cast down, and with the expression of a man contemplating mutiny, Mr. Goodlaff sat there, probably trying to figure out how to use his butter knife to a satisfying effect on his table mates. Ever heard the saying: "Make my words as sweet as honey, for I may have to eat them later"? Let's just say I'm keeping a spoon handy. 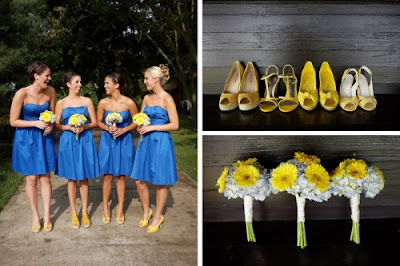 A while ago I told the Goodlaff bridesmaids that they could wear silver shoes for the wedding. Just like with their dresses, the style could be of their own choosing, and if they already owned silver shoes, so much the better! Sparkly, tall, short, peep toe, doesn't matter; as long as they can stand up in the shoes, the shoes are good with me. 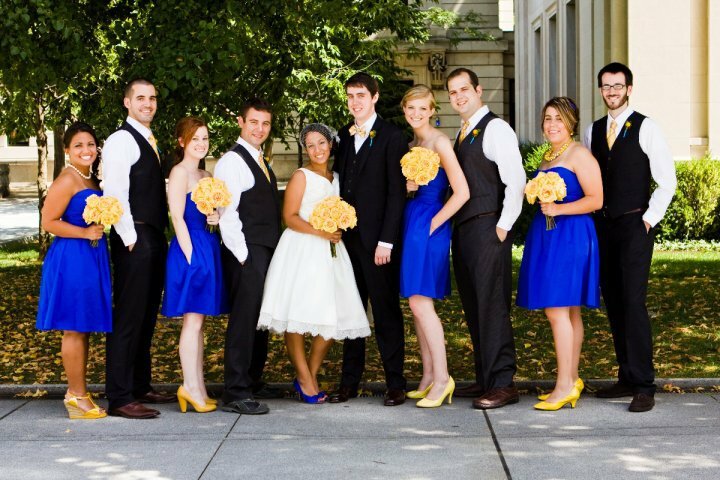 Holy crap, they are wearing yellow shoes! ﻿And just like that, I was in love with the idea of yellow shoes. It's one of our colors! It looks so cute! So. Cute. 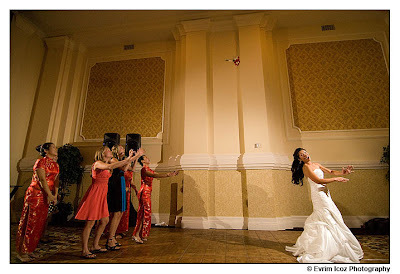 Of all the "traditions" that Mr.Goodlaff and I are happy to be tossing out the window at our wedding, the typical bouquet and garter toss might be the one we are most relieved to see go. Loathed by all single guys and girls everywhere (including me at one point), it was an easy decision to cut it out of the program. I don't want to single out my few single friends and chuck my bouquet at them, and Mr. Goodlaff doesn't want to fish up my skirt in front of a bunch of people (even if they are family and friends) to find a garter. Plus, most of Mr. Goodlaff's friends are married, which could lead to the most predictable garter toss ever. Before Mr. Goodlaff and I were even engaged (in fact, way before there was even a Mr. Goodlaff), I knew that I wouldn't be putting all of my bridesmaids in the same exact dress. Because of my college roommate's love of all things bridal, I had seen a company that made bridesmaid dresses in a rainbow of colors with mix and match tops and bottoms. Even at 18, I recognized the benefits of picking a color and letting everyone choose what they were most comfortable wearing. Unless your girls are all 6 foot Swedish Bikini Models, you're going to have trouble finding a single style that not only flatters everyone, but that everyone also feels comfortable in. 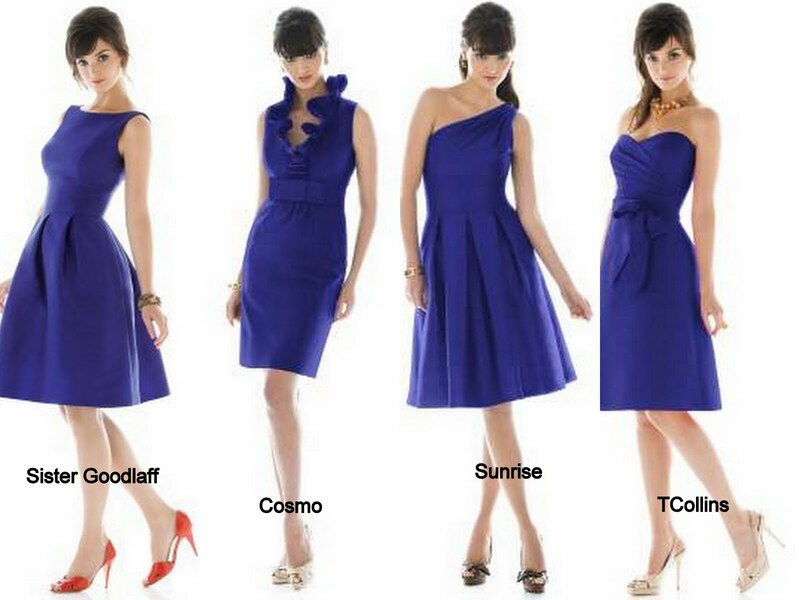 Fast forward about 9 years to a few months ago, when I was frantically searching for the right shade of blue for the bridesmaid dresses. My conversations with Mr. GL went something like this: "This one's too blue blue, but that one's too navy blue. I do like this one, but it's just too cerulean, you know?" He almost had to get out a box of Crayolas to see what I was talking about. I looked at David's Bridal (Horizon was too bright, Marine too dark) and Alfred Angelo, and was beginning to expand my search when Mama Goodlaff, Sister Goodlaff, and I went to the Folsom Bridal show. They still make my heart flutter. Have you ever been to a Bridal Fair? Oh. My. God. My first Bridal Fair was last April, when I was newly-engaged, mostly vendorless, and still in the process of forming a wedding vision. 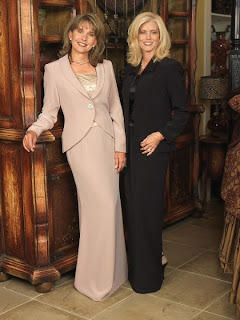 Mama Goodlaff, Sister Goodlaff, and I headed over to the Folsom Bridal Show in search of...well, if I'm being honest, we weren't really looking for anything. We went because the shiny ring on my finger gave us an excuse to venture into once-forbidden territory; it was a bridal fair and I was a bride, 'nuff said. Upon arrival, the fair organizers gave me a goody bag (bubbles! ), a vendor bingo card with the promise of being able to spin the wheel for a fabulous prize, and shuffled the three of us out the door and into the main hall. 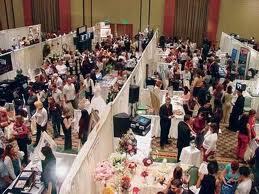 That's when I learned that a bridal fair isn't champagne and roses--it's barely controlled wedding vendor chaos. The Yellow Pages come to life and there's row after row of real, live vendors desperate to talk to you, all peddling their wares and services, and after a while, it becomes total bridal overload--especially when you don't know what you're looking for. I talked to photographers, bakers, DJ's, caterers, wedding planners, florists, and spa owners. I wrote my name and contact information dozens of times to enter a drawing for "insert a free something for the lucky winner here". Christmas brought Sister Goodlaff to us all the way from L.A., and with her an opportunity to try and answer an as-yet unresolved wedding day question: what to do with my face? I would like to say she followed all three rules, but I would be lying. You know what I hate? Deceptively easy online tutorials--they get me into all kinds of trouble. 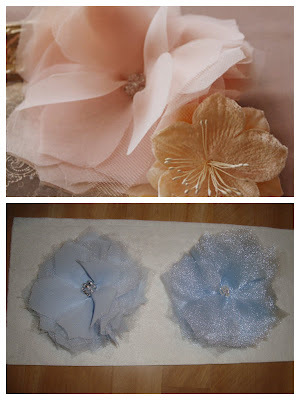 I've blogged before about the DIY Chiffon and Tulle flower from Project Wedding, and how my flower and their flower didn't quite look like they were cut from the same cloth (heh). Let's refresh, shall we? ﻿﻿I know I've done this project before, but the other day I decided I would make my own veil and realized I would be needing a fascinator. The two flowers I've already made are in the wrong color. It would appear that I am a glutton for punishment, because I decided to go for round two and try making the flower again. This time, I documented the process of following this tutorial.